Netanyahu and others recite special blessing after release of longtime US prisoner. 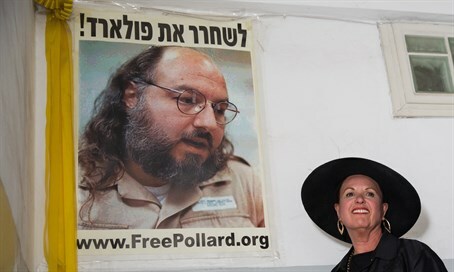 Prime Minister Binyamin Netanyahu welcomed the release of longtime prisoner Jonathan Pollard on Friday, after he was released following over 30 years in US prison. "The Jewish people welcome the release of Jonathan Pollard," he said. "As someone who brought up the issue many years with the US President, I have longed for this day." "After three long and difficult decades, Jonathan will finally, finally be reunited with his family," Netanyahu continued. "I wish Jonathan that this Shabbat give him happiness and quiet, and that it should continue for the rest of his life." Simultaneously, two politicians on opposite sides of Israel's political spectrum - Jewish Home chairman Naftali Bennett and Opposition leader and Zionist Union chairman Yitzhak Herzog - issued the same exact message: Baruch Matir Asurim, "Blessed be the One who frees prisoners," a blessing from the morning service said daily. Deputy Defense Minister MK Rabbi Eli Ben-Dahan (Jewish Home) also issued a statement with the blessing. "Jonathan Pollard merited today to learn anew the term 'freedom,'" Ben-Dahan added, noting that for most people, the term "freedom" is a given, rather than a privilege. Ben-Dahan noted that Pollard, sadly, did not get the chance to meet again with his rabbi, Rabbi Mordechai Eliyahu, before the latter's death; Rabbi Eliyahu visited Pollard several times in prison. "I am sure, however, that in heaven, there is a special happiness with his release," he said. Knesset Speaker Yuli Edelstein (Likud) said a different blessing in honor of Pollard's release: shehechiyanu v'kiumani le'zman hazeh, the blessing for new experiences and special events (lit: 'thank you for allowing us to live to see this' - ed.). "I send to Jonathan a warm embrace, comfort, and love in my name and in the name of the entire Knesset," he said. Interior Minister MK Silvan Shalom (Likud) gave Pollard's release an especially warm welcome. "After 30 long years, our brother Jonathan Pollard is free," said Shalom. "The activities that the Israeli government and citizens carried out during these long years are finally bearing fruit." He added: "We are waiting to see him here with us soon, in Israel, as a free man. Jonathan go home, we love and and are waiting for you." "Baruch Mattir Assurim," President Reuven Rivlin said. "We all welcome the release of Jonathan Pollard, after many long and difficult years of prison." "For all these years we hurt for Pollard, and felt responsible and obligated to bring his release," he continued. "We welcome today Pollard and his family in their reunification and wish them long, good, and healthy years of tranquility." "I welcome the release of Jonathan Pollard and wish for his first Shabbat as a free man, after many years, to symbolize a new path for him and a quiet life with his family," Defense Minister Moshe Ya'alon (Likud) tweeted Friday. MK Dr. Nachman Shai (Zionist Union), head of the Knesset Caucus for Jonathan Pollard, noted that his role would not end with Pollard's release. "The Caucus will not end and is not disbanding," he wrote Friday. "We see now a new goal: to remove the restrictions placed on him [Pollard - ed.]." Pollard has been barred from leaving the US, among other restrictions, for the next five years. "We demand to remove all restrictions on his mobility, his [contact with and access to] the media, and which harm his basic rights of citizenship, and to allow him to leave the US to any place he chooses - and, first and foremost, Israel," Shai continued. "We demand it." "Throughout the years we have followed you and and tried to help you as much as possible," he added. "The public campaign for your freedom has engaged the entire world." "In honor of your release from prison, I want to welcome you. This is a big day and an important one, one in which we say: Baruch Matir Assurim." "Even after 30 years, the story has not ended and won't be complete until Jonathan gets to come home to Israel," MK Oren Hazan (Likud) tweeted. "Pollard, our dear brother, we wait for you to come home with V'Shavu Banim L'Gvulam, speedily in our days - amen." MK Shuli Muallem-Refaeli (Jewish Home) agreed. "Pollard may have been released from prison, but he is still not a free man," she said. "The struggle for Pollard's freedom will continue until he reaches Israel." "The Jewish people will not forget the dream of a man who sacrificed his personal life for the sake of national security - [the dream] to be free in his own country."